Sitting near a bone fire for a couple of hours to smoke the meat is a very long process. It’s too difficult to roam near the fire and anytime any incident can ruin your trip. It seems a good idea when you go crowded with your friends. But at home, it is very boring to sit alone for a longer time. Instead, you can get a less time-consuming and easy to use propane smoker. You can go to your bed while your food is cooking. It’s like press the button and enjoy. Which is best propane smoker for your home ? You are free from the irritation of the smoke. You never need to check your food or rotate it while smoking. Just turn on and set the propane smoker, and enjoy your time with your friends or family. It's more safe and reliable. You can take it to your camping site as well. I am wondering that you all have one question popping in your head, Isn’t it? Yes, which propane smoker is the best one? A good propane smoker needs some features in it like portability, material used, working costs, functions, and safety. These makes you choose a best propane smoker for your kitchen. These smokers aren’t much expensive but you should check their condition well. Some manufacturers use very thin metal for its construction and as a result, you can see smoke leakage. So, you need to keep these points in your mind. It is a masterpiece in vertical chamber smokers. It weighs 66 pounds and is highly portable. It has four smoking chambers with 700+ sq. inches of space. Its burner is made up of stainless steel. It has a switch ignition system. Its wood chip space is covered with porcelain. You can lock its door which has a temperature gauge built inside you prevent overheating. Its handle is made up of wire because it does not get hot while working. You can maintain the temperature according to your need. You can go as slow as you need because chicken gets brilliant flavour when you smoke it for a longer time at lower temperature. The insulated doors of this smoker keep the heat inside in a better way. It got wheels at the rear legs to make it handier. Very durable and well built design. Very easy to re-assemble and set up. It has a smaller water tray which needs more refills. You need to open the door, again and again, to fill the tray if you are using for a longer time which means the loss of temperature. The weight of the smoker is a little more which can affect its portability in lifting and placing. 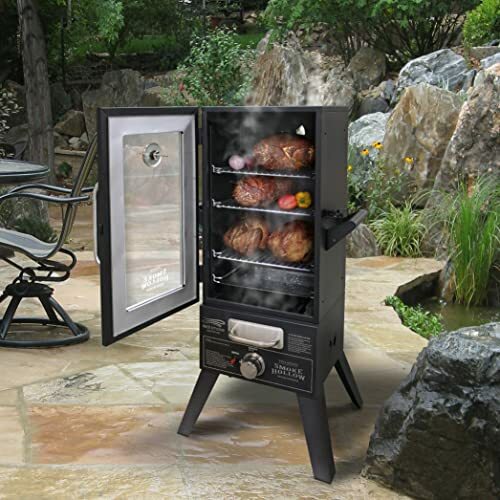 This smoker has three cooking racks in it which provide about 7,566 cubic inches space for cooking. 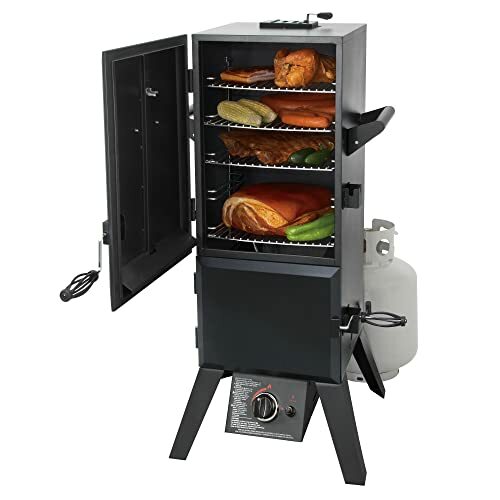 You will experience the better smoking texture and taste in this gas smoker because it gives you the power to control the heat for a long time. The warming shelves are on the top of the smoker cabin. You can reach the ultimate temperature above 300 in the chamber. The wood chips tray and water pan have porcelain cover on them. It is made of steel and weighs about 76 pounds. You can smoke your food in it at low or high temperatures. Just get some wood in the tray and pour your favourite liquid in the water pan and you are on. Works steady at low temperture. It has less space for cooking inside. Its dimensions are low where you can get you full chicken piece. The wood and water pan are too close that water can spill on your wood chips. This is one of the most portable propane smokers on the market. It is better than any other smoker in several ways. It’s so handy that you can carry it anywhere in your car. It is the perfect choice for outdoor parties. It will give a dashing look to your barbeque. It only weighs 22.5 pounds. You can fold its support limbs before transportation. It will never take much space in your car. 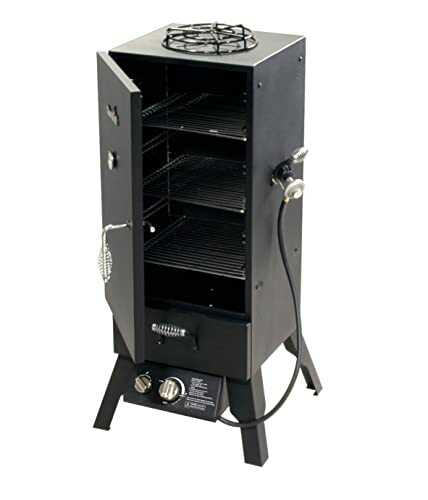 Masterbuilt portable gas smoker is fully made up of stainless steel. It has an inbuilt thermometer you record the chamber temperature. It's water and wood tray are removable. You can control its temperature and make it stable at any point. Being portable, it got a lot of space inside. You can get a whole turkey inside it but it needs more water because of the smaller tray. You can replace its trays with a bigger one and enjoy your barbeque. I think if you are an outdoor lover, you should definitely buy this stuff. Very efficient and uses less propane. You can’t check the flame without opening its door. Its temperature is affected by the wind, sunlight and other factors. You can lose your constant temperature with the 1 lb propane cylinder at low temperature. 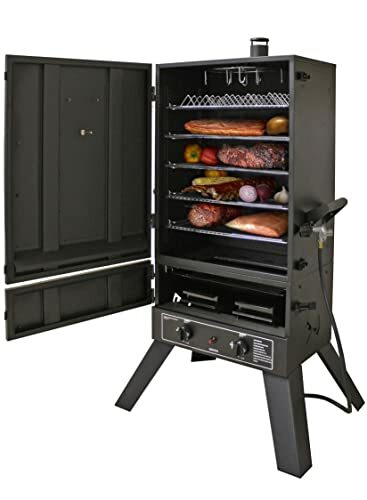 Dyna-Glo gas smoker has more than 750 square inches space for cooking inside. It got four racks inside for more durability and easy handling. It weighs only 54 pounds having a two door design. It uses propane as its main fuel. You get electronic ignition system where you need to press a button and you are on. You can set it at different temperature with a dial on its control panel. The smoker has a steel wood chip box with porcelain coating and handles on the either sides. The water bowl is also stainless steel made for long lasting and easy cleans. It has two doors for extra smoking effect. You can see the temperature of the room in its inbuilt gauge. It has a quite big storage for the pork or turkey. You can fulfil your fantasies with this box. Easy to set up and start. It has very thin metal plates on its walls. It can be a problem in some situations like outdoors. The thermometer does not reflect the actual temperature inside the room. It has no insulated interiors which can lose the heat. It has two wood chips trays having porcelain on them. It gives you nice storage for longer cooking and bigger pieces. It beast weighs about 100 pounds. It has steel surrounded which is welded to save more heat inside and increases its durability. You don’t need to compare its weight with any other smoker because it’s meant for it. You don’t need to open the main compartment for refilling as the bottom one will do it for you. Just open the door and check your trays. It helps to keep the heat inside and loss is negligible than single door smokers. You can reach the ultimate temperature of 450 with this box. Very huge space to fill. Can reach very high temperatures. Easy to refill the trays. It is too heavy to transport it for your outdoor parties. You should be really tough for that. It cost much to your pocket but its return is delicious. These all smokers are best in their task and will make you happy. But which one is the best propane smoker? If we are talking about the best propane smoker, we need to check out the features which make any smoker a good smoker. I will declare Masterbuilt 20051311 GS30D 2-Door Propane Smoker as the winner because it has amazing all-rounder features. Its running cost is less. You can port in from one place to other. It does its job extremely good. 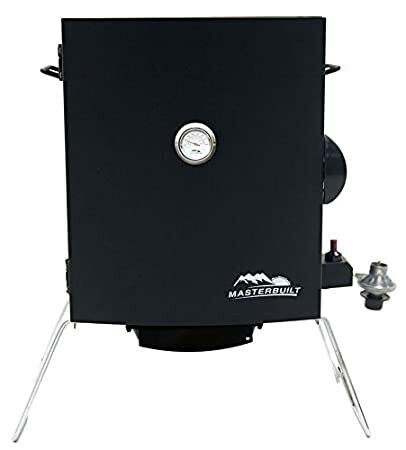 Masterbuilt propane smoker has nice portability, best functions, and high standard material and extremely best is its price. 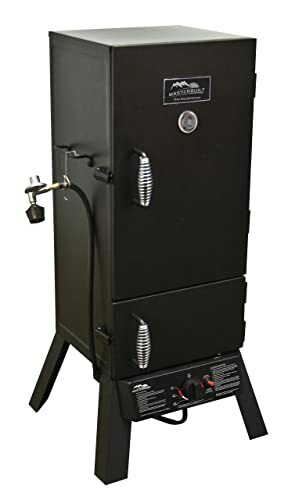 You don’t have to spend a lot for this smoker as you will get it back in your very first smoking experience with this mind blowing propane smoker. Thanks to all for reading my post. Have a delicious day. If you don’t choose a best propane smoker, you can read more here best pellet smoker .